Measurements of neutron fluence rates and corresponding absorbed dose and dose equivalent rates in high energy (greater than 10 MV) x-ray radiotherapy beams are especially difficult due to the large ratio of photons to neutrons and a lack of knowledge of neutron energy spectra. Photons interfere through photonuclear reactions in the detector and through pulse pile-up problems in detectors employing electronic pulse measurements. Responses of neutron detectors depend upon incident neutron energy and fluence-to-dose conversion factors vary strongly with neutron energy. These factors require a knowledge of neutron energy spectra which is very difficult to obtain. An exhaustive review of the physics of neutron production in high energy x-ray machines and measurement techniques, has been recently published by the National Council on Radiation Protection (NCRP) 1 . 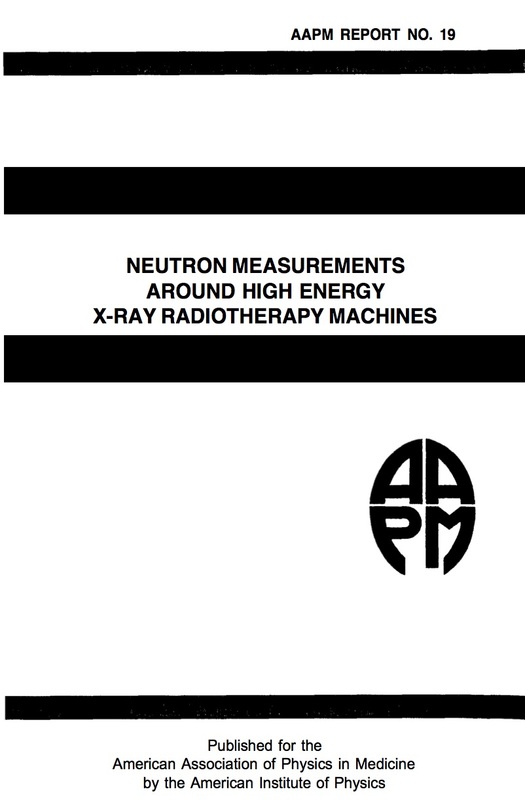 Despite the availability of this NCRP report and numerous scientific papers dealing with neutron measurements near high energy x-ray beams practical guidelines for such measurements are not easily available to clinical physicists. In response to this need, the American Association of Physicists in Medicine (AAPM) Science Council formed the Radiation Therapy Task Group No. 27 on "Neutron Measurements Around High Energy X-Ray Radiotherapy Machines" with the following specific objectives: 1 . Recommend methods of measurement of neutron leakage around a high energy radiotherapy machine and provide a detailed step-by-step description of these methods. 2 . Recommend instrumentation needed to perform these measurements. 3 . Publish a summary of the recommendations. The following report presents the recommendations of this task group in regard to these objectives. The first part of this report deals with neutron measurements in and near the primary photon beam, and the second part deals with measurements outside the treatment room.